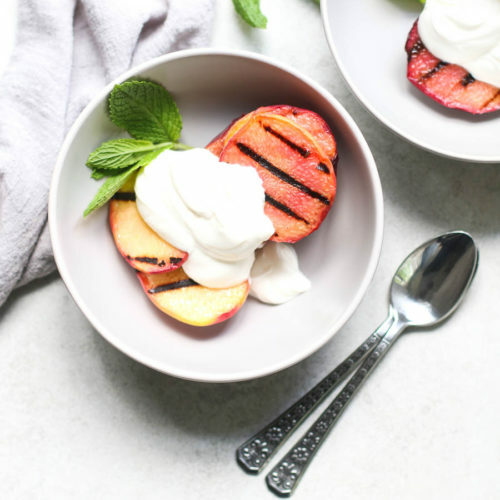 Grilled peaches and honey whipped yogurt “cream” come together in a super simple summer dessert. With just 4 ingredients and a hot grill, this sweet treat is ready in 10 minutes! It’s finally peach season – one of my favorite things about summer. It’s also officially grilling season. 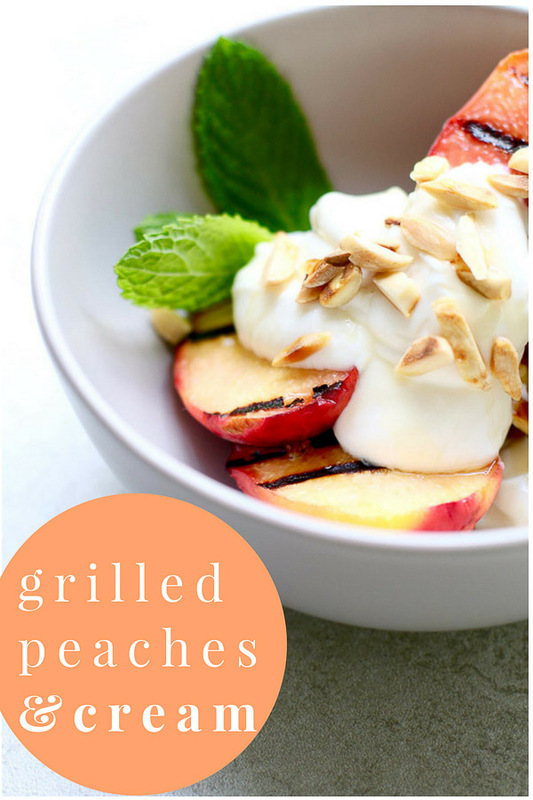 And if you’re going to fire up the grill, you’ll want to add my grilled peaches and cream recipe to the menu. To make this dessert you’ll only need four ingredients and a hot grill (or grill pan). Using seasonal fruit is a sweet shortcut to an effortless dessert. For the peaches, simply slice and pit the peaches. That’s right… no need to peel them! Once the peaches are cooked, if you don’t want to eat the peel, you can easily pull it right off. I prefer freestone peaches because the pit is much easier to remove. But early in the season, you might only be able to find clingstone ones. If that’s the case, use a spoon or paring knife to remove the pit. To prepare the peaches for the grill, brush the cut side with a light coating of oil. This not only helps prevent the peaches from sticking, but it also allows the fruit sugars to caramelize, which adds flavor. I am using Thrive® Algae Oil because it has a neutral flavor. And with a smoke point of up to 485°F, it can take the heat while allowing the grilled peach flavor to shine through. 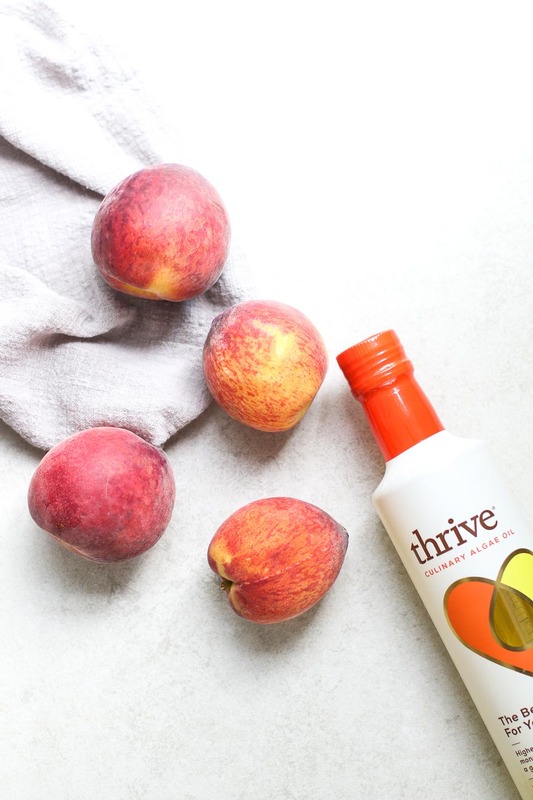 Thrive is actually a good swap for other cooking oils, whether you’re grilling, sautéing, roasting, or baking. It’s packed with monounsaturated fats (a good fat) and has the lowest level of saturated fats of any cooking oil with only 0.5g per serving. I like to whip the “cream” ahead of time or while the peaches are grilling, so the final dish can be enjoyed warm. And when it comes to the cream, use what you like! I am using full-fat Greek yogurt with a touch of honey for a rich, creamy texture. 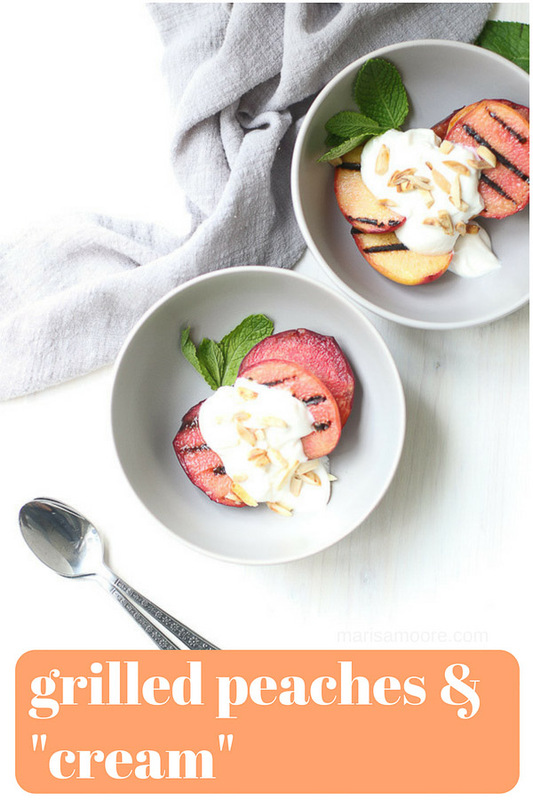 The yogurt delivers just enough tanginess to complement the sweetness of the peaches. The Greek yogurt also provides a little protein which makes this dessert all the more satisfying. Plus probiotics! 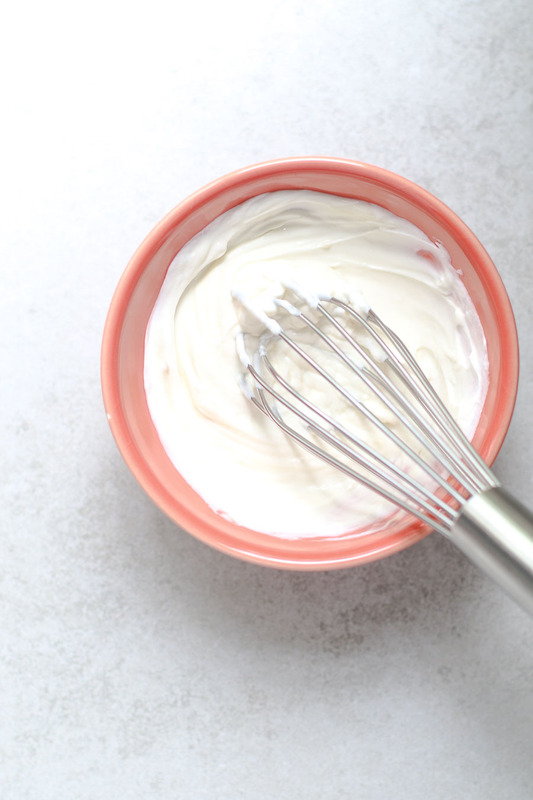 If Greek yogurt isn’t your thing, feel free to swap coconut, almond, or any non-dairy yogurt or make your own whipped cream using coconut milk. Once the peaches are ready, top each half with a big dollop of the honey whipped yogurt. You can also add crushed nuts for texture if you’d like. Plan to serve each person two peach halves with cream but the recipe is easy to double or even quadruple to satisfy a crowd. I hope you’ll enjoy this recipe at home this summer. My local readers in the Southeast can pick up a bottle of Thrive at Publix stores. They’ll also be hosting occasional in-store tastings if you want to taste first, so keep an eye out! If you’re not from the area, Thrive ships nationwide from Amazon. 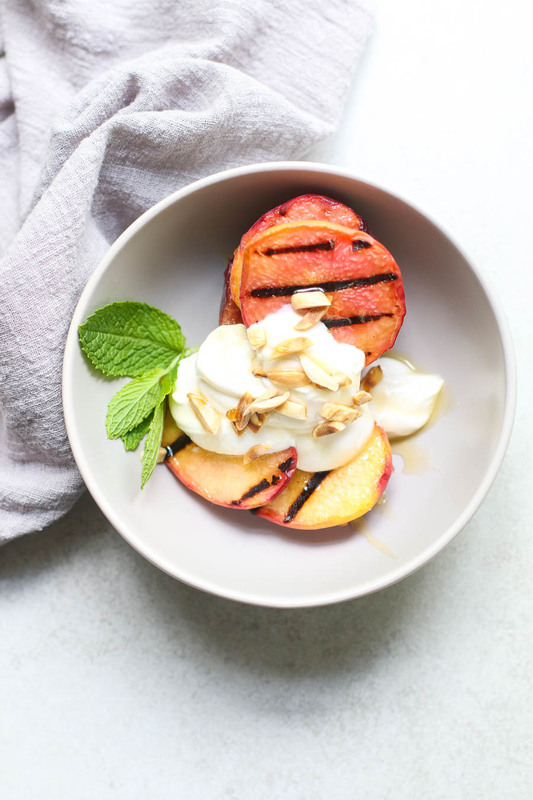 But first, here’s the easy grilled peaches and cream recipe. Be sure to tag me on Instagram when you make it and PIN IT for later! 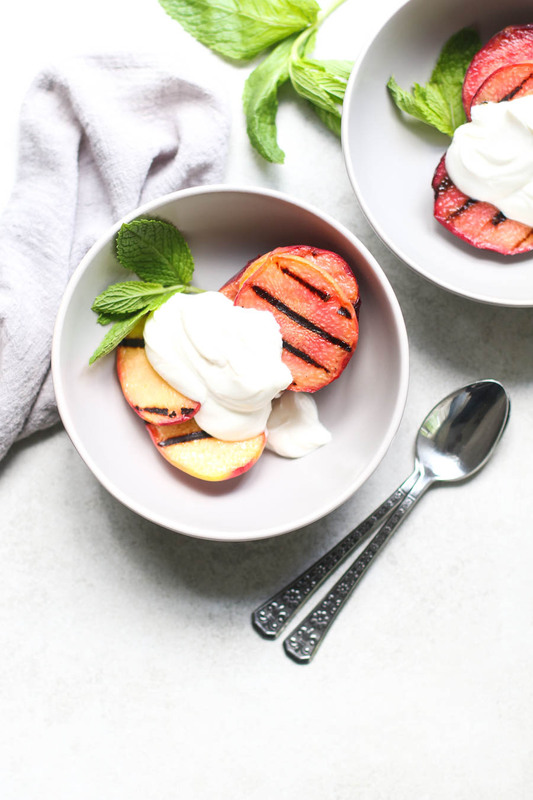 Grilled peaches and honey whipped yogurt “cream” come together in a super simple summer dessert. With just 5 ingredients and a hot grill, this sweet treat is ready in 10 minutes! Heat the grill or grill pan to medium heat. Lightly brush the cut peaches with oil. Place the peaches cut side onto the grill. Cook about 4 minutes, just until grill marks appear, and the peaches are tender. Remove the peach halves with tongs and transfer to a serving bowl or plate. Serve warm, topped with a dollop of whipped yogurt "cream." Add an extra drizzle of honey, chopped nuts, and mint, if desired. Once the peaches are cool enough to handle, you can pull the peel off with a gentle tug or skip that step and serve with the peel on. Yes. You can use a lower fat or even a non-fat Greek yogurt but it won't be the same. I skipped heavy cream in favor of the yogurt for the protein and probiotic benefit. The full-fat version adds a velvety rich texture that you just won't get from a non-fat yogurt. To make this recipe vegan, swap the honey for maple syrup and the regular Greek yogurt for an almond, cashew, or coconut milk yogurt. There are some almond milk Greek yogurts on the market with a great texture so you might try that first. You can't really go wrong with grilled fruit and yogurt for dessert. Yum! What a simple yet yummy idea! I'll be trying these next summer! I have yet to grill peaches but these look so delicious. 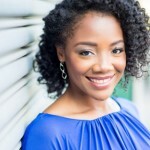 Definitely bookmarking your post for this summer.